using 106 samples in the main library PLUS 236 patches created by Guru Nation (over 35 customers that LOVE to make patches created this bonus library!) for a total of 378 inspiring patches that ALL use NEW SAMPLES from Oberheim analog synthesizers. Recorded with care and excellent attention by Kurt Strohmeier. ​ include Bass, FX, Pad, Lead, Synth and Textures all recorded from various Oberheim synthesizers including the Matrix 1000 and OB-Xpander. These samples have a very unique “smooth and warm” quality to them that only come from vintage analog hardware! Oberheim synth samples including Basses, FX, Bells, Keyboards, Brass, Synth, Pads and more! deribing from Oberheim synthesizers recorded by Kurt Strohmeier. Using 105 NEW Oberheim samples recorded by Kurt Strohmeier. 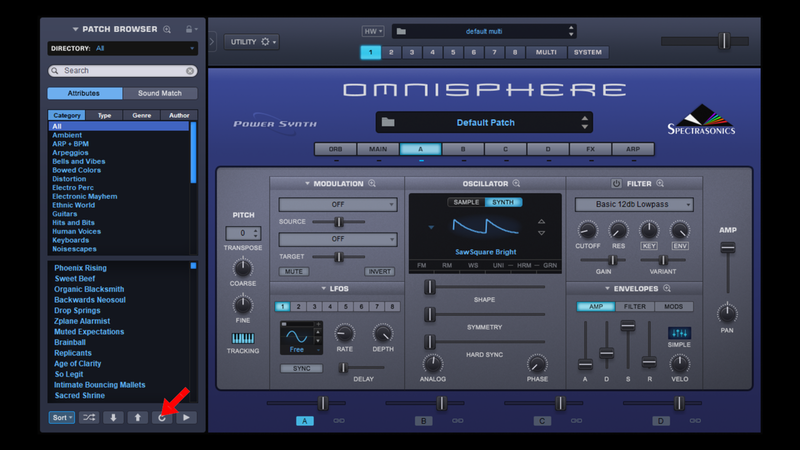 Locate the PluginGURU Retrosphere V1 folder you have just created and open PlugInGuru Retrosphere V1.omnisphere to install the main library patches and the samples and subsequently the PlugInGuru RetroSphere V1 BONUS.omnisphere file to install the bonus patches. In case the PluginGURU Retrosphere V1 and the PlugInGuru RetroSphere V1 BONUS banks aren't active in the left window after installation, you can access the PluginGURU Retrosphere V1 and the PlugInGuru RetroSphere V1 BONUS patches by clicking on the DIRECTORY tab on the top left of Omnisphere’s main window to select the PluginGURU Retrosphere V1 and the PlugInGuru RetroSphere V1 BONUS entries as shown in image 2 and image 3 below. 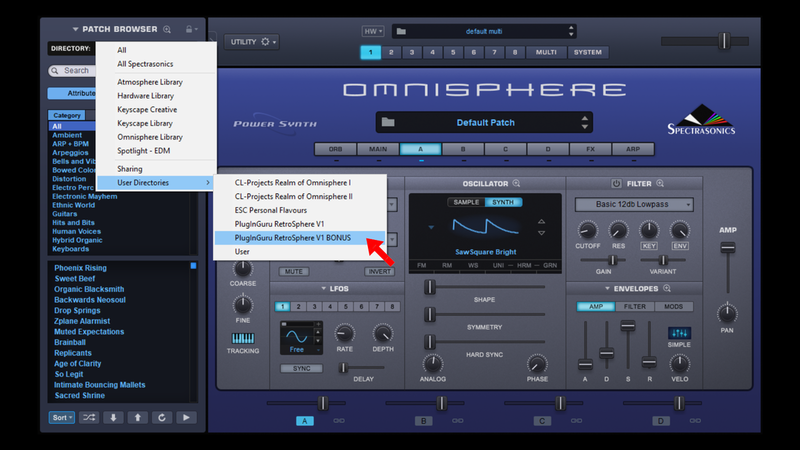 If you still can't see the PluginGURU Retrosphere V1 and the PlugInGuru RetroSphere V1 BONUS patches after installation, click on the Refresh circular arrow button on the bottom left of Omnisphere’s main window as shown in image 4 below. 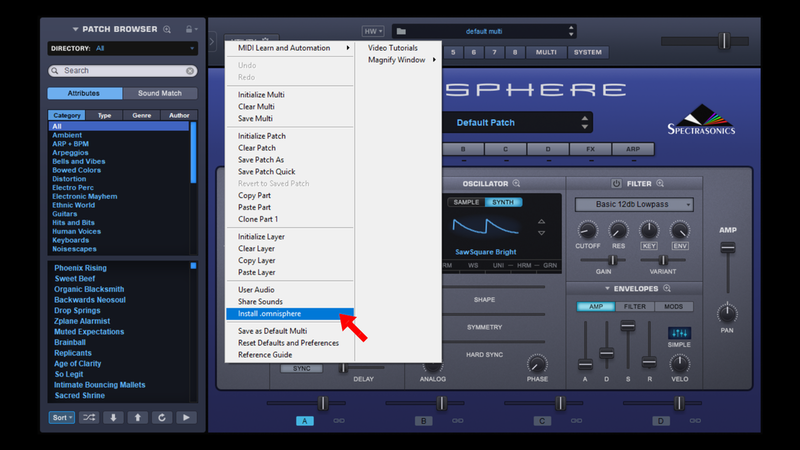 If the PluginGURU Retrosphere V1 and the PlugInGuru RetroSphere V1 BONUS entries are not visible after refreshing the database, either close Omnisphere and open a new instance and if even that doesn’t help, restart your DAW.